When I think of "neoclassical", I generally think of violin-inspired guitar shredders like Yngwie Malmsteen, but really, since "neoclassical" just means that it's heavily influenced by classical music, I suppose any instrument would do. I might as well go ahead and tell you that in this case, Texan one-man project Goatcraft's chosen instrument is a piano. Now, I have a tendency to ridicule "black metal" acts (usually keyboard-driven) that have almost nothing in common with metal, but this is different. Doing its level best to live up to its declared extreme-metal ancestry, The Blasphemer summons up some of the darkest, most evil-sounding piano music you're probably ever going to hear -- and the man behind it is good at what he does. After a symphonic intro and some background rumbling comes the piano in Temptation and Fall, heavy on the sustain pedal and the minor keys. The high, normally cheerful tinkling of the upper register has a nervous, frightened sound to it, and the pauses, behind which one can hear vague hissing sound effects (very minimal, nothing corny) are rendolent with ill omen, eventually fading out to start the next piece, House of Death. Some of the best goth metal bands have done this as an intro, or interspersed piano passages to increase atmosphere, and of course black metal bands like Summoning have used keyboards as the primary instrument to great effect in many of their pieces, but all the songs are like this, and it never gets old; more on that in a minute. This is a full-length recital, a serious enough effort to be played in a classical concert hall -- as long as all the concertgoers wore black robes, hoods, and were prepared to make a sacrifice to Satan, anyway. Hecate starts with a spacey electronic background theme, then overlays little clusters of piano notes like short chimes before going back into the distant electronic synths, the piano dancing gingerly through the song. This one is even more introspective and atmospheric than the other tracks, which is saying something considering this album. The fact that this remains interesting throughout an album consisting of 100% piano with a bit of ambient noise to accompany it has to do with the fact that the pieces are so varied; Lonegoat, the pianist, can project an atmosphere of breathless waiting (in some of the Great Dragon pieces), thunderous, crescendo-filled action (Nebuchadnezzar) and an ominous calm before the storm (such as Eternal Prayer of Urizen). The tracks' underlying concepts, all inspired by the paintings and poetry of William Blake, in whose work Lonegoat sees an anti-religious tone, fall on rather stony ground with a listener not provided with any lyrics to help him along (I cheated and read the album promo sheet), but the dark beauty of all Lonegoat's complex compositions on this track is enthralling from beginning to end. 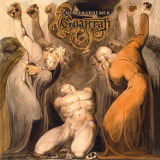 The Blasphemer is fascinating in its own right as piano music, but it evokes a metal atmosphere with equal seriousness. This manages to fuse classical music with metal with enough adeptness that checking it out is highly recommended.